9-6-2014: Rarely encountered these days. An original MP41 offered for sale in France. Also a Haenel produced MP40. Atelier Saint Etienne is regularly offering original WW2 German small arms. The owner is speaking fluently English. 20-4-2014: The page about the Magazine cleaning brush/Reinigungsbűrste fűr Magazin MP needed revision badly. I have added the official documents explaining the instruction, use and official designation.Photos are also updated. Most interesting thing I learned that the official manual instructed the users of the MP38 and 40 to not oil the magazine after cleaning it with the brush but to keep it dry. 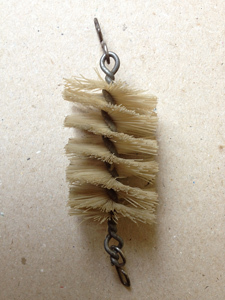 The evaporated oil mixed with dust and dirt would lead to severe stoppages as a result of friction in the upper part of the magazine. 15-3-2014: Another "bring back" story. It is amazing how regularly Mp40's are still found worldwide. Also one in "slightly" worse condition. Directly from the East front! 15-3-2014: Please beware! On ebay reproduction MP38 lower receivers are offered. The honest seller is selling them as reproduction (so no false accusations) but they might end up being sold in newly assembled MP38's and then sold as originals. 15-3-2014: The list with MP38, MP40 and MP41 serial numbers has grown to almost 600. I have updated the list and changed the format a bit using an Excel pivot table. Let me know if you like it this way. I can always go back to the old format. If you want to do some "data mining" yourself then let me know and I can sent you the total list in Excel format. Please keep on sending me those serial numbers! 7-2-2014: Shooting demo with a MP40 (off course ;-) and some over-exited shooters! 2-2-2014: After World War II many countries used the MP40 and it's accessoiries. Some countries like Norway and Austria even produced new accessoiries for the MP38 and MP40. The Norwegian homeguard used the MP40 even still the early nineties of the 20th century. Inaddition to the pouch page I added a small page about the Norwegian and Austrian pouches. Most of the visitors probably do not care about this post war equipment. 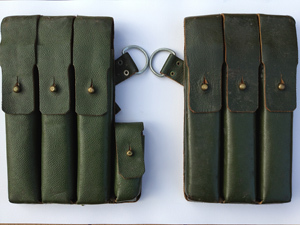 It might however be interesting because the Austrian pouch is often sold as being an original (World War II) pouch. Many Austrian pouch have been encountered with fake Waffenamt stamps and MP38 u.40 stamps. Stolla Wien was the factory of these pouches and used their commercial logo on it. This is something that would have never been done during World War II. 12-1-2014: A fantastic detailed photo of all parts of the MP40.http://candrsenal.com/ allowed me to place this photo on this website. More great exploded views of historic arms like the U.S.Thompson M1A1, the Soviet PPsh, the British Sten Mark V. etc.